This is a listing for a 1 inch pin button badge. 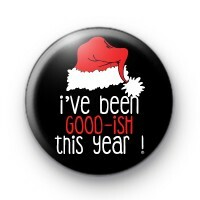 Its black with a red and white santa hat and the text 'Ive Been Good-Ish This Year in white font. Have you been naughty or nice? Santa always finds out. We have a huge selection of handmade Christmas themed button badges in the shop so make sure you check them out.